Red wines, 44 samples, produced from the same grape (100% Cabernet Sauvignon), harvested in different geographical areas, have been collected from local supermarkets in the area of Copenhagen, Denmark. Details on the geographical origins and number of wine samples analysed are given in Table 1. The wine samples have been analyzed using head space GC-MS and FT-IR analytical instruments. The FT-IR was a commercial WineScan instrument provided by FOSS Analytical A/S. For each sample a mass spectrum scan (m/z: 5-204) measured at 2700 elution time-points was obtained providing a data cube of size 44×2700×200. In Figure 1 an example of a chromatogram for one red wine sample is shown. Figure 1. 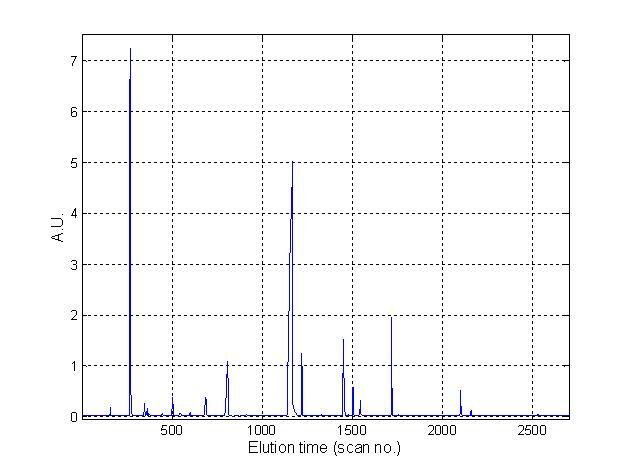 Typical chromatogram showing the TIC (Total Ion Count) of one red wine sample. In the figure the abundance at each scan is found by summing the contribution of all intensities of mass channels investigated (m/z: 5-204). 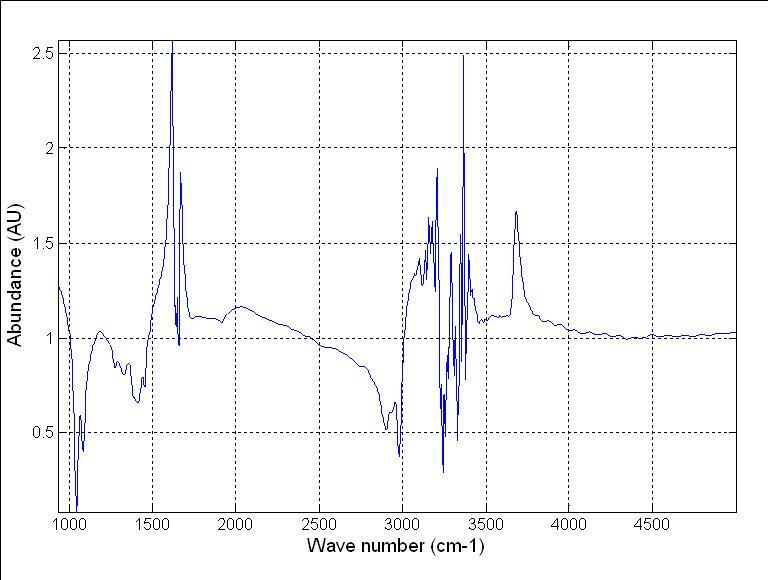 For all wine samples 14 quality parameters were predicted from the IR spectra (Figure 2) using the FOSS WineScan build-in calibration models (Table 2). Figure 2. Typical IR spectrum of one red wine sample. The water band regions around 1545-1710 cm-1 and 2968-3620 cm-1 should be excluded from the data analysis. The data are available in zipped MATLAB 6.x format. Download the data and write load Wine_v6 in MATLAB.